With rapid DNA sequencing now routine, genetics researchers are increasingly testing the clinical utility of its application in various healthcare settings and the barriers to using genomic information in healthcare decision-making. In doing so, some are discovering that their research might be subject to a Food and Drug Administration (FDA) regulation known as the investigational device exemption (IDE) regulation. However, many in the genetics community are unfamiliar with this regulation. To raise awareness of the IDE regulation, ASHG hosted a policy luncheon at ASHG 2017 that included representatives from the FDA, the research community, and the National Human Genome Research Institute (NHGRI). Presenters explained the relevance of the regulation for genomics research, described an experience of applying for an IDE, and made attendees aware of helpful resources available to the genomics community. (L-R) Policy Luncheon presenters Kate Donigan, Jonathan Berg, Cristina Kapustij, and Derek Scholes. Katherine Donigan, PhD, from the Personalized Medicine Staff at FDA began the session by speaking about the IDE regulation itself and her office’s role in ensuring public health and safety while supporting innovative research and discovery. She explained that genomics research has made great advancements since the IDE regulation went into effect in 1976, and that research using next-generation sequencing where results are being returned to participants warrants consideration under the IDE regulation. Studies can fall into one of three categories: IDE exempt, Nonsignificant Risk (NSR), and Significant Risk (SR). Only SR studies require FDA involvement, and Kate outlined the variables that her team uses to determine SR, such as the invasiveness of sample collection and the potential for false results. She advised researchers to reach out to FDA to talk through their proposed studies before applying for a grant, so that they know in advance if their research will likely be categorized as SR. This will facilitate a faster IDE application and approval process once grant funding has been awarded. Jonathan Berg, MD, PhD, from the University of North Carolina then presented on his experience as a trailblazer in interacting with FDA regarding IDE regulations for genomic studies. Jonathan’s NC NEXUS project in the NSIGHT consortium explores the utility of exome sequencing for enhancing newborn screening by sequencing both healthy newborns and infants previously identified through newborn screening, and studying parental decision-making on the additional genomic testing. He detailed the multi-year long process his research group struggled through to become aware of, apply for, and eventually receive an IDE approval. Jonathan explained that he is supportive of FDA oversight but that the regulations need to be applied in a way that does not derail scientific research. He offered some words to the wise: get help! Discuss the risks involved in your research studies with your IRB or other institutional regulatory assistance staff, or consult with the FDA. Cristina Kapustij, MS, from NHGRI rounded out the panel by outlining the support role her policy team offers to stakeholders and grantees embarking on human genetics research. She explained that NHGRI is working as a bridge to the FDA for researchers looking for guidance on the IDE process when they are designing studies or applying for grants. She described a workshop hosted by NHGRI in 2016 and drew attention to the NHGRI Points to Consider online resource. The panel concluded with a Q&A session. Attendees asked great questions about diverse topics from funding to return results, retrospective research with biobank samples, streamlining the IDE submission process as technology continues to advance, and more! Check out the information below for more details on IDEs. Christa Wagner, PhD, is the 2016-17 ASHG/NHGRI Genetics & Public Policy Fellow. For more information on the fellowship and application details, please visit the Genetics & Public Policy Fellowship website. One of our colleagues selected to give a platform presentation at ASHG 2017 will not be able to join us in Orlando. Arvin Haghighatfard, a graduate student at the Islamic Azad University, is unable to travel from his home in Iran due to new restrictions on travel to the United States. Throughout my presidency this year, I have spoken out about how the new rules limiting travel to the United States threaten to undermine scientific progress both in the U.S. and elsewhere in the world. Science is an inherently international endeavor and the Society strongly opposes the imposition of undue restrictions on scientists’ travel. As an organization representing human genetics specialists worldwide, we consider international travel a major and integral part of our enterprise. The difficulties that Mr. Haghighatfard has experienced are exactly the kind of situation we feared. Upon learning of his unfortunate experience, we contacted the Department of State on his behalf to raise our concerns, but without success. Given these exceptional circumstances, I believe it is important that we provide Mr. Haghighatfard the opportunity to present his work, so we have arranged for him to conduct his presentation remotely. I fear that there may also be other geneticists in Iran or elsewhere who cannot attend the meeting because of the travel restrictions. When we gather in Orlando later this month, I hope we spend a moment to think of those in our global genetics family who are unable to join us. Nancy Cox, PhD, ASHG President, directs the Vanderbilt Genetics Institute and is a Mary Phillips Edmonds Gray Professor of Genetics. She is also the Director of and a Professor of Medicine in the Vanderbilt Division of Genetic Medicine. You asked and we listened! To reduce our footprint on the environment, ASHG is no longer offering the full printed Program Guide that we have in previous years. Instead, the most important meeting details, including convention center maps and a schedule overview, will be published in the Program-at-a-Glance. Full information can be found on the official ASHG 2017 Mobile App (available for iOS or Android), Online Planner, and meeting website. The ASHG 2017 Mobile App is available for iOS and Android, and as a web version. Check it out! Create an account with the Online Planner to browse and save sessions of interest, create your schedule, and sync across desktop and mobile devices. While on site, you can flag sessions to track continuing education; browse sessions, posters, and exhibit booths by location; and take notes. The app is a helpful networking tool – use it to email speakers and message with other attendees who have opted in to these functions. If you prefer another calendar app, you can export your schedule to any other app supporting .ics files. Similarly, you can add personal meetings and events to your ASHG 2017 calendar. Prefer the printed versions? No problem! Our Documents and Downloadables page has printable versions of all Program content, as well as other useful materials. Pauline Minhinnett, CMP, CEM, is ASHG’s Director of Meetings. For more information on ASHG 2017, visit the meeting website. ASHG 2017 features several new initiatives and special features to help attendees connect with the latest human genetics science – and each other – in novel, productive ways. Watch our video on the latest changes and enhancements to the ASHG Annual Meeting. CoLaboratories (CoLabs), are exciting new networking lounges and educational theaters in the Exhibit Hall. 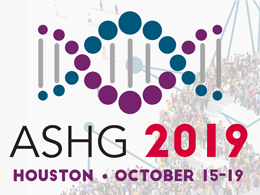 Organized by high-level themes – clinical, laboratory, and data – these short events are organized by ASHG, partner organizations, and exhibiting companies. They focus on a single, specific topic or tool, and are free to attend with no advance registration required. Each CoLab is paired with a networking lounge to facilitate conversation after the session ends. These events are a great way to meet colleagues and potential collaborators who share your interests, and to learn the basics of new tools to help you reach your goals. Be sure to review the CoLab calendar as you start planning your ASHG 2017 schedule! And don’t forget: the people who staff exhibit booths at ASHG are often your peers! Don’t be afraid to ask them what sessions they find interesting or what new technology has made their jobs easier. They will often share interesting information and remember – they are there for you! They want to talk to you and get your feedback. We’ve also made some changes to the annual Society awards, presented in sessions throughout the meeting. Each award presentation will feature a short lecture by the recipient about his or her current work, past and present challenges, and notable accomplishments. Browse these talks on the schedule of events. While ASHG’s awards program is over 50 years old, this year’s slate includes our first-ever Early-Career Award, which recognizes scientists in their first ten years as an independent investigator. Finally, we’ve revamped the ASHG/FASEB Mentored Travel Awards Program for Underrepresented Trainees, which now includes a substantial mentoring component. Congratulations to this year’s 13 awardees! Check out our website for details on other new initiatives at ASHG 2017. See you in Orlando! Carrie Morin, CEM, is Exhibits, Sponsorship, and Meeting Marketing Manager at ASHG, and Pauline Minhinnett, CMP, CEM, is Director of Meetings. For more information on ASHG 2017, visit the meeting website. Note: We have received a number of inquiries about any potential impact of Hurricane Irma on ASHG 2017 in Orlando. We are in regular touch with local authorities and convention center staff, who report all facilities should be ready to welcome ASHG attendees as planned, and we will continue to monitor the situation. Starting to plan your travel to Orlando? Consider taking a day or afternoon to venture out of the city and check out some of these area neighborhoods (listed alphabetically). This is Orlando’s first “ecodistrict,” a sustainable shopping and dining community. Dine here and experience the rewarding taste of farm-to-table foods, locally sourced ingredients, and award-winning cuisine. Audubon Park offers a myriad of specialty food and drink options, most of them being locally-owned small businesses. In addition to its unique boutique stores and dining, this Orlando gem hosts endless foodie festivals. On the eastern edge of town, Leu Gardens never fails to awe visitors as a vast botanical paradise. Although Audubon Park is geographically small, the possibilities for enjoyment are boundless. Located in northern Orlando, this town takes its title from its Ivy-inspired street names—visitors will find themselves walking down W Harvard Street to cross Dartmouth Street. If you’re in the mood for a stroll, College Park boasts many paved pathways circling its multiple lakes. If you want to take part in some higher learning to reflect the streets along which you travel, visit the Orlando Science Center or the Orlando Shakespeare Theater. The area is also known for its inimitable shopping boutiques and retro dining locations. Follow a trip to the local thrift shop with a cup of coffee at Shaker’s American Café and sip as you look at their extensive collection of vintage salt and pepper shakers. The “Traditional American Town of Celebration” is exactly as idyllic as you would expect a community developed by Walt Disney to be. The 1950s-inspired neighborhood is a must-see for Disney enthusiasts. Even if you’re not a Disney lover, the town offers many attractions, with most food and shopping located in its Town Center. The town may be uniform in appearance, but the food is diverse enough to serve all tastes. Visit Columbia Restaurant for Cuban and Spanish fare, Ari Sushi for hibachi, or the Town Tavern for a burger and fries. Lake Nona refers to itself as “a community of and for the future,” and a trip to the town will prove it’s a well-deserved tagline. The community is sprinkled with breath-taking art installations amongst its plentiful shopping and dining options. The Town Center includes brand-name shopping as well as boutique options, while also serving as great spot to sit outside and enjoy the Floridian fall weather. As a town devoted to health and wellness, Lake Nona’s bike share program and lengthy trails are hard to beat. For a unique dining experience, visitors should visit Canvas Restaurant and Market, an American-Latin fusion eatery with an attached market that sells food, drink, household goods, and local artisan crafts. The northern Orlando city of Winter Park is an arts-filled area rich in culture and activity. Visit for the day and peruse the art in the Charles Hosmer Morse Museum, walk through the Mead Botanical Garden, or take a stroll in one of the more than 70 parks. If you’re in for a nautical adventure, there are numerous boat tours that take you through the Lakes of Winter Park. With wide-spanning activities from orchestral concerts to luxury shopping to outdoor music festivals, you can always count on finding something to entertain you.